Heel Height: 3.5" w/ 1" Platform. Shoes are in Excellent pre-owned condition. See pictures for details. "Pre-Owned shoes aren’t perfect. Exterior width: 3.5". COLORFUL STAINED GLASS PATTERN canvas fabric open toe uppers on thick man made chunky high heels that look like brown wood. Wrap style over the toes. Buckles around the ankle. SIZE 9 1/2 made by XHILARATION. I wore these to work and to wear dresses before my feet grew. They were very comfortable. Great Condition shoes with mild spot wear on the suede. 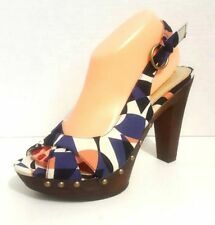 Xhilaration Ankle strap block heels size 8. Fun Aztec print on back of shoe. Do not have original box. COLOR Black & Whine. Product Specifications.